My third Lake Trout happened to be a massive, 34×22″ monster that weighed in at 16.375 pounds. It had barotrauma, and I had no descending device to release it at depth, so I was forced to keep it. While not terrible fare compared to other trout, it’s not worth killing a fish close to you in age unless it’s phenomenal table fare. It’s not often that the planets align and everything goes so swimmingly well that you catch a fish against all odds, but that’s exactly what happened. After my friend, Dean Limb of Yaktactics, crushed it fishing for lakers from his kayak for several months, I decided to get in on the action. Fishing a massive lake mid-winter for huge lakers isn’t everyone’s idea of how to spend a winter day, but during my Thanksgiving Break, that’s exactly where I found myself. I hadn’t accounted for just how bad the roads could be, nor the boat ramp being closed, so I didn’t get on the water as quickly as I’d like. Around 10 a.m., I launched my kayak. The day was remarkably clear and sunny for late November at 5000 feet, and I was pleasantly surprised to find a calm lake surface as I paddled out. Dean and his wife, Katey, were supposed to join me later that day, and I figured I’d just mess around until they showed up. 1. 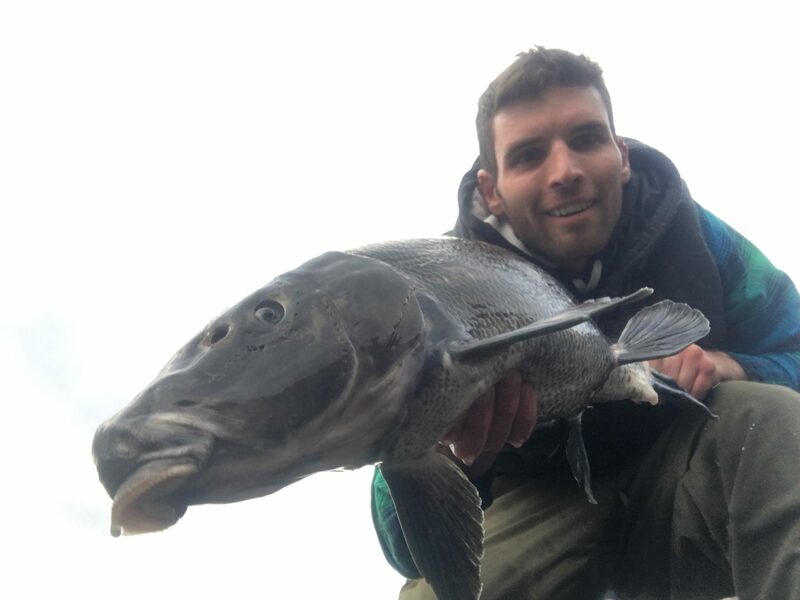 Apart from one attempt at lakers from my float tube in another lake that took 45 minutes to kick out in high winds and five minutes to be blown back to shore, I’d never chased the species before. 2. I was on a kayak — not the ideal winter fishing craft. 3. I had no fishfinder, a necessity when fishing for lakers. 4. My net wasn’t really large enough for big lakers because I’d yet to purchase the RS King Landing Net capable of fitting 30-plus-inch fish with ease. Yet, even still, I paddled out maybe half a mile from shore to a spot I’ve since mapped with my fishfinder and know is about 80 feet deep. I dropped my jig down and let it hit the bottom. I bounced it once and felt resistance: my first laker. I fought it to the surface, and boated my first-ever 30-plus-inch fish. Balancing on my kayak, I was able to get a decent picture. My first 30-plus-inch trout was a laker I caught on my first drop laker fishing. It measured 32 1/4″ long. I texted Dean “Fishfinder Smishfinder” with this picture, and I will never live that down. Read another version of this story by clicking here. Read the next entry in #SpeciesQuest here: Species #114 — Reticulate Sculpin. For a fish with “moron” in its scientific name, this fish was hard to catch. When I first started planning my trip to Phoenix, I knew my fishing time would be limited because I was there for work. So as I made a list of species I wanted to catch, and I reached out to Chris Moore (@arizona_anglers) on Instagram. He proved to be a wealth of information and was my first true experience with the generosity of Species Hunters in sharing their spots. He helped me find and add Rio Grande Cichlid, three species of tilapia, and my Grass Carp. That’s not to mention all of the carp (including koi), channel cats, bass, and sunfish I caught. Though I struck out for Sonora and Desert Sucker in the middle of nowhere, I was pretty thrilled with my success. The only problem was that Yellow Bass were supposed to exist in a small pond I’d fished several times that was just a short drive from my hotel. It was theoretically an easy fish to entice with half of a nightcrawler; you just had to find one of the relative few fish present. 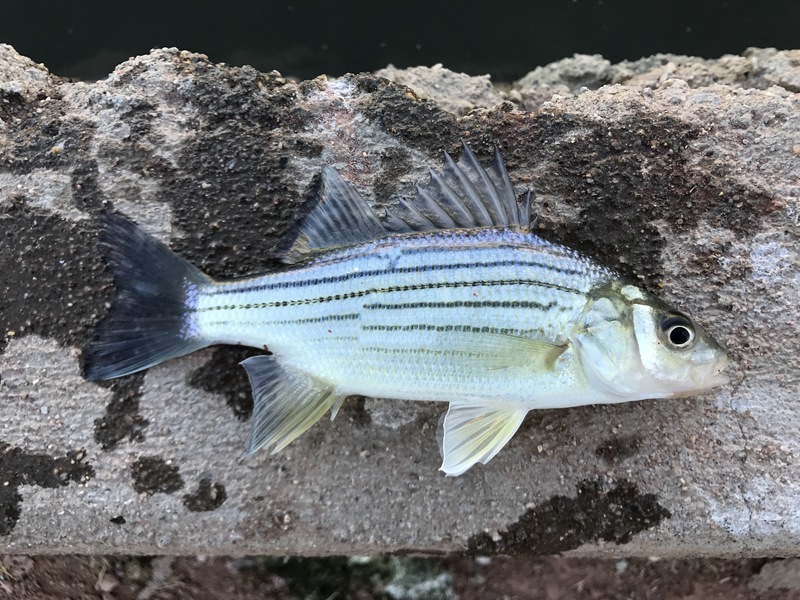 I spent all of my spare time on the last few days of my trip trading penny stocks (I made about $3000 that trip) and reading about fishing for Yellow Bass. I learned they tend to like deeper channels and feed in rotating circuits along the bottom, though they can be found up in the water column, as well. With less than an hour to fish on my final day, I forsook the the side of the pond that had been so productive and moved to a narrow channel that seemed to be deeper. It was a longshot, but I threw out my worm and waited. Less than 15 minutes passed before I began counting down the clock. I had a flight to catch, after all, and I still had to return my rental car. Just as I began to think it was time to admit defeat, my rod bounced, and I pulled in a single, eight-inch Yellow Bass. Six species in three short stints of fishing in an inland urban area smack-dab in the desert during the winter, and I’d managed three species. I didn’t even mess with micros. I’d wanted to, but I left my newly-purchased Owner New Half Moon micro hooks at home, so I had to sit and watch Western Mosquitofish and what I think were some species of silverside swarm the waters all around me as I stood there, powerless to do anything about it. Packing up my rod, I felt pretty good about myself and the new species I’d caught, having know way to know my next new species would be a monster that I’d catch with incredible luck/skill on my very first cast. Read the next entry in #SpeciesQuest here: Species #113 — Lake Trout. Targeting the Lost River Sucker can get you in trouble, as this is a Federally Endangered Species. I love these fish, and I do catch them incidentally on occasion, but I’m always careful to release them quickly and keep them in the water or on wet vegetation (as shown above) if they must be removed from the water, say to remove a hook or wrapped line. Note: It is illegal to target this fish. Every post up until now has included a location, but this one will remain secret to protect this incredible species, as it is endangered. I should also be clear that I do not advocate fishing for endangered species, nor do I actively target them. That said, as an avid angler who has averaged 100-220 days on the water annually for a decade, I do catch endangered fish from time to time. When that happens, I take care to handle the fish properly, release them as quickly as possible, and ensure these scarce and vulnerable fish are treated with the utmost respect. Interestingly enough, as a friend and dedicated biologist once told me, “It’s a shame we live in a world where we’re supposed to feel bad for accidentally catching these amazing fish.” So I don’t feel bad; I feel honored. I view every incidental hookup as a chance to set a positive example, a chance to, in my own way, offer condolences and make amends to a species for what my own did to it. I also view it as a promise, a promise that I will do everything in my power to help and support the future of these fish so that one day we can target what have the potential to be truly world-class freshwater gamefish. When I caught this Lost River Sucker, I wasn’t really expecting it. A friend had told me he’d landed several trout and a surprise sucker in that general area earlier that month, but it was so cold and snowy, I had pretty well tempered my expectations. Then I got a bump. When fishing steelhead jigs in Upper Klamath Lake, I usually throw out, wait a second or two, then twitch up. I repeat this sink-jerk motion on most retrieves. Trout usually hit on the initial drop or during a subsequent jerk. The fish pictured below was no different. When fishing with marabou jigs for trout, expect to snag a lot. I hooked and lost another good trout before a wind knot distracted me long enough to allow the jig to sink to the bottom. I expected to be snagged, so when I pulled up and felt weight, I wasn’t surprised. Until it moved. A trout had grabbed my jig off the bottom, and I was thrilled. It started sucking line off my reel so viciously that I imagined I’d hooked into something big. I wasn’t wrong. When the fish jumped and did a front-flip out of the water, I noted how unusual it was for trout to jump like that in cold weather. Our Redbands jump, but if you fight them with skill, you can usually avoid this. Not always, but usually. When it jumped a second time, I noticed how dark it was. When it jumped a third, fourth, and fifth time, I realized it wasn’t a trout. In 1984, the Lost River Sucker was listed under the Endangered Species Act. I’m a sucker for pretty fish. Lost River Suckers can be photographed during the late spring and summer in the Williamson River where they spawn. Be careful not to touch them, but if you move slowly, you can often get close enough for a good picture. My Species #83, endangered in ’84. Is that darkly poetic? I don’t know, but it certainly adds value to a species I already treasure. I landed that fish, and it was, in fact, a Lost River Sucker. It wasn’t huge, but I’ve since caught quite a few of them, and many have been over 10 pounds. 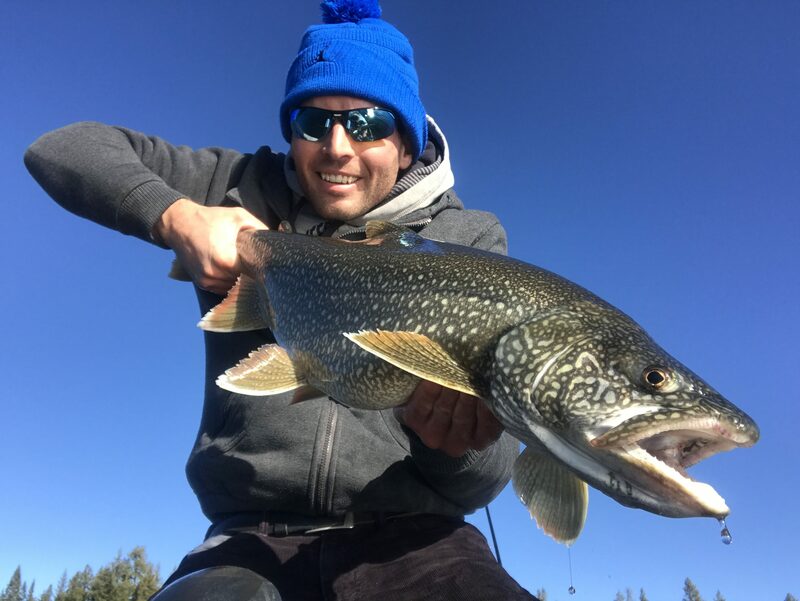 These fish live upwards of 30 years, and the average fish I’ve caught has been about 26-28 inches long and weighed in between six and nine pounds depending on whether it was male or female, pre-spawn or post-spawn. Tragically, almost all spawning fish are 15 years old or more, with many of the spawners in their 20s and 30s. If recruitment does not improve, these gorgeous fish will be extinct within my lifetime, likely before I go gray. Not wanting to disturb the fish too much or risk snagging one, I threw a few more casts before calling it a day. There are more than a dozen sites in the lake where they spawn, and you don’t have to look far to find dead fish in the spring. Some die of old age, some of disease, some of predation or the pressures of the spawn, but an unacceptable number are caught and killed intentionally by anglers. Either snagged with treble hooks or hooked legitimately with worms, many ignorant anglers throw them on the bank even now, some 30 years after it became clear the species was at risk of extinction. 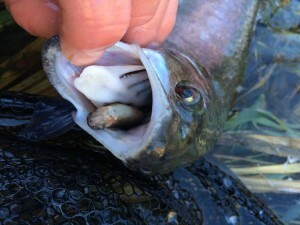 I’ve snagged my share of suckers over the years while trout fishing, and for that reason, I now only use single hook lures (typically either swimbaits or jigs) in places frequented by Lost River Suckers. Again, use jigs and single-hook swimbaits only when fishing around spawning sites. You might snag one even still, but it’s unlikely. If you do, it will cause less damage. The trout still readily take these jigs, too, so don’t fret.Though the trout fishing in that spot where I caught my first blued-up male is phenomenal (the trout come to eat sucker eggs), I hesitate to fish there for fear of snagging a sucker on traditional trout gear. When I do try for trout there now, I’m careful to only use jigs and swimbaits with single hooks. No spinners, spoons, or Rapalas. I’ve seen people intentionally snagging them in the back, and anyone throwing a treble hook out there knows what they’re doing. Not only is it disgusting and irreverent, it’s highly illegal. Male Lost River Suckers develop white tubercules on their skin which help them maintain contact with the female during mating. They are absolutely gorgeous. They are also susceptible to snagging from unethical and uneducated anglers while spawning. The suckers, often erroneously called “sucker fish”, are a treasure that should be appreciated. These fish grow to 40 inches and 20 pounds, and I’ve never caught one that didn’t jump. The potential for a sport fishery if and when this species recovers should be enough incentive to treat them with respect, but if it’s not, know this. If the suckers die out, the greatest wild native Rainbow Trout fishery in the United States — the Klamath Basin — will suffer. The single greatest draw for tourists will suffer. The largest fish I’ve ever landed from Klamath Lake was this 32-inch, 12-pound Lost River Sucker that took a jig. Anglers should pull for this species’ recovery, so we can pursue this fish as a top-notch sport species someday. 1) Handle it as little as possible. Some intepretations of the law suggest even posing for a photo is illegal. The maximum of 10 seconds I’ve taken to pose for a picture with my larger suckers was a risk I was willing to take. I released them quickly, but know you could potentially get in trouble for doing so. 2) Keep it wet. Measurements can be done in the water (if at all) and should not result in unnecessary air exposure. 3) Keep the location secret. If you do find the suckers, especially during the spawn, don’t share that information. For one, there are people out there still who would massacre them. Don’t take that risk. Sometimes, I set my rod down and just take pictures of the fish while they spawn. If I move slowly, I can get surprisingly close and get some great pictures. This fish was chilling in water barely deep enough to hold it. The current was light, and I was able to get an awesome picture from above. Avoid standing on gravel, but if you happen to float by or see one from the, it’s completely okay to take a picture. I like taking pictures of them to show others the beauty I see and inspire action to protect these amazing fish. Not all suckers will pose for a photo. Some get out of there as soon as they see you. The Williamson River holds most of the suckers I’ve seen, but they can be anywhere. For that reason, I’m careful to use only single-hook lures when they’re around — just in case. When the trout bite picks up, you can occasionally catch suckers, but you can’t target them. Then again, with less than 10,000 fish remaining in the wild, you really couldn’t target them if you wanted to. Last summer, I snagged a massive sucker while trolling at Rocky Point that was every bit of 15 pounds. I fought it almost 10 minutes, and it tail-walked half a dozen times. It pulled my kayak almost half a mile before the hook came out. Since that day, I’ve stopped trolling spoons. As great as these fish are, and as fun as it is to catch one incidentally, the stress of being snagged could kill a fish, and that means one less spawner. Don’t risk it. I initially wrote about these amazing fish here and gave the impression I was urging people to fish for them. That wasn’t the case. In my follow-up article, I emphasized that it is illegal to target them, but I’d love to see this species recover so that is no longer the case. Wouldn’t you? Read the next entry in #SpeciesQuest here: Species #84 — American Shad. Coastal Cutthroat Trout are some of the most beautiful creatures on God’s Green Earth. I debated how to record this species. 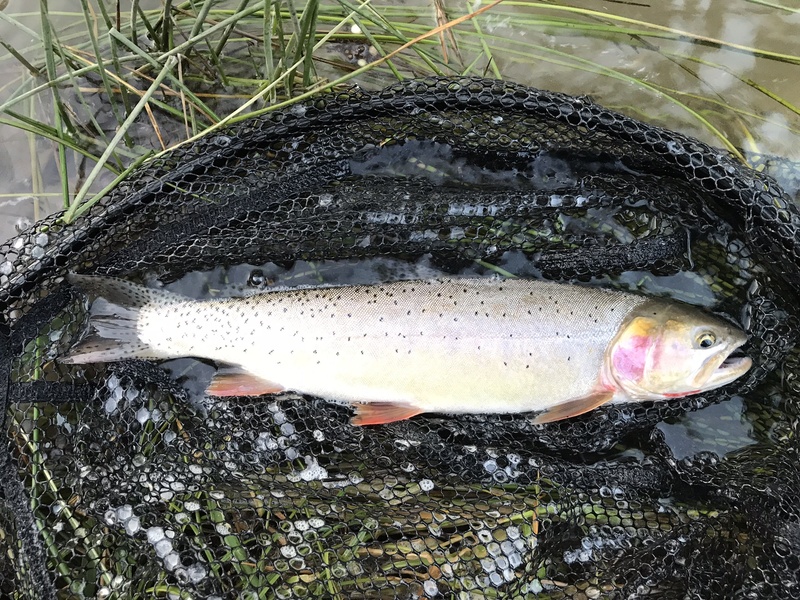 The reason being that there are 10-to-14 living subspecies of Cutthroat Trout (depends whom you ask), and many anglers document and note each subspecies separately. Obviously I do. And while I’d like them to be classified as separate species for my own purposes, they aren’t. So what I’ll do is tell you the stories of the subspecies of Cutthroat Trout I’ve caught so far. Unlike my other individual species posts, I’ll add to this one every time I catch a new subspecies. So here it is: a chronological list of the all of the Cutthroat subspecies I’ve caught, beginning with the first one (Coastal), the one that made Cutthroat Trout Species #34 in my #SpeciesQuest. Speed limits are the worst. I openly oppose highway speed limits and long for the days of old where motorists could careen down the highway at absurd speeds, using only their forearms as seat belts for children bouncing around in the front seat of the car. I kid a little, but I still think speed limits are dumb. Unfortunately, the officer didn’t agree with me, and I was cited for doing 70 in a 55 as I made my way to Fourmile Lake to chase some of the massive Brook Trout I’d seen caught there in years’ past. My mood was further soured when I was skunked at Fourmile Lake, beginning a lifelong hatred of a place so beautiful, yet so unproductive as a fishery (disgusting Hatchery Rainbows aside). I decided I’d go to my native streams, making my way to Little Butte Creek. I landed a bunch of little brookies and met a guy who told me he’d caught a bunch of Westslope Cutthroat Trout in nearby Big Butte Creek earlier that day. I didn’t think Westslope Cutthroat Trout were found West of the Cascades (in actuality, they’re not), but I hopped back into my car and drove. 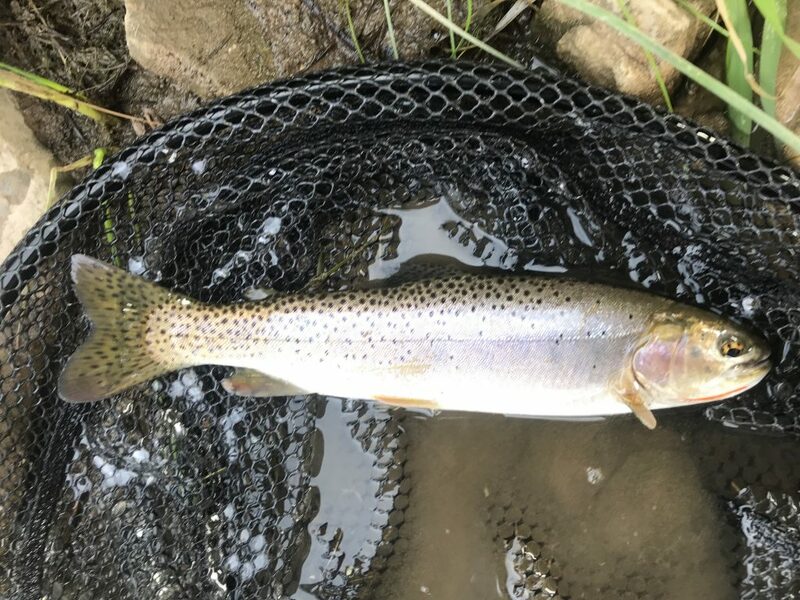 Trout in streams fish the same almost everywhere, and I quickly landed small rainbows and a fish that bore faded red slashes below its jaws but otherwise looked like a Rainbow. It was, in fact, a Cutbow. Where these species in the same genus overlap, they often hybridize. Rainbow-loving anglers have transplanted these fish all over the West outside their native range in Northern California, Oregon, Washington, British Columbia, and Alaska. While they provide great fisheries if and when the populations establish wild populations, they often out-compete native Cutthroats and/or hybridize them out of existence in much the same way invasive Brook Trout have overtaken Bull Trout. Calling a Rainbow Trout invasive would cause most flyfishermen to have a conniption, but they are often true invasive species. 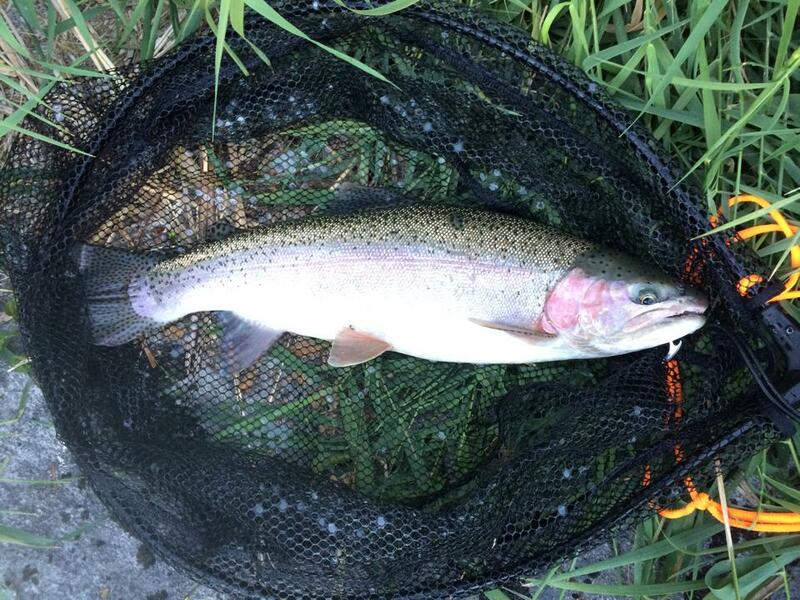 Nonetheless, both species are native to the Rogue Watershed where I was fishing, but Rainbows were just more aggressive, I guess. When I moved upstream of a small dam between the Butte Falls Fish Hatchery and the town of Butte Falls, the small yet deep impoundment there looked perfect for a Rapala. 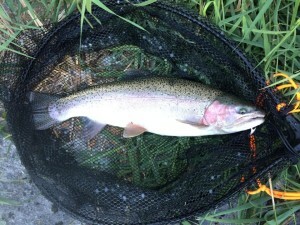 The respectable, 10 1/4″ Cutthroat Trout that smashed my Countdown Rapala agreed. The fish was more than half a pound and remains one of the larger Cutts I’ve ever caught. For awhile I believed it had been a Westslope Cutthroat, but I eventually learned it was a Coastal Cutthroat Trout. 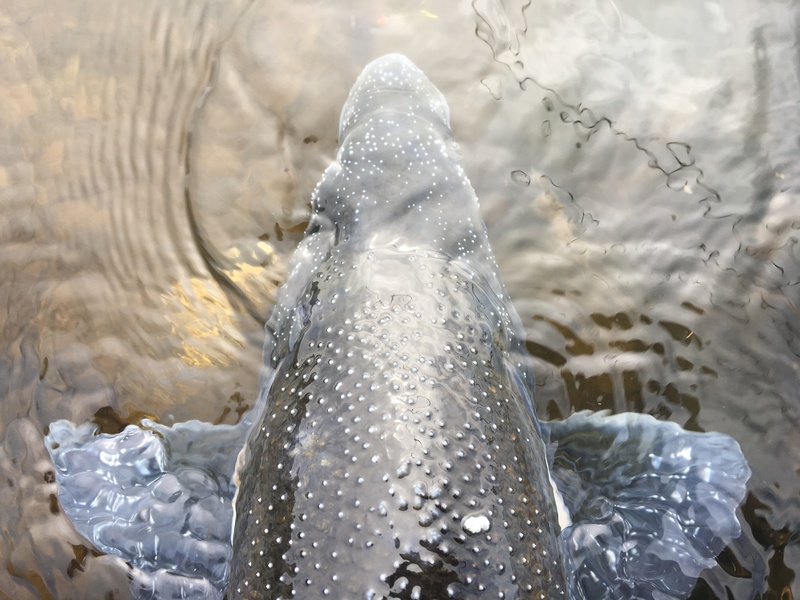 These elongated, piscivorous silver bullets are heavily spotted everywhere except their bellies and have much longer heads and larger mouths than comparably-sized Rainbows. Lahontan Cutthroat are probably the most well-known cutthroat subspecies, partially because they’re gorgeous and grow to massive sizes. Color variability between Cutts is tremendous. 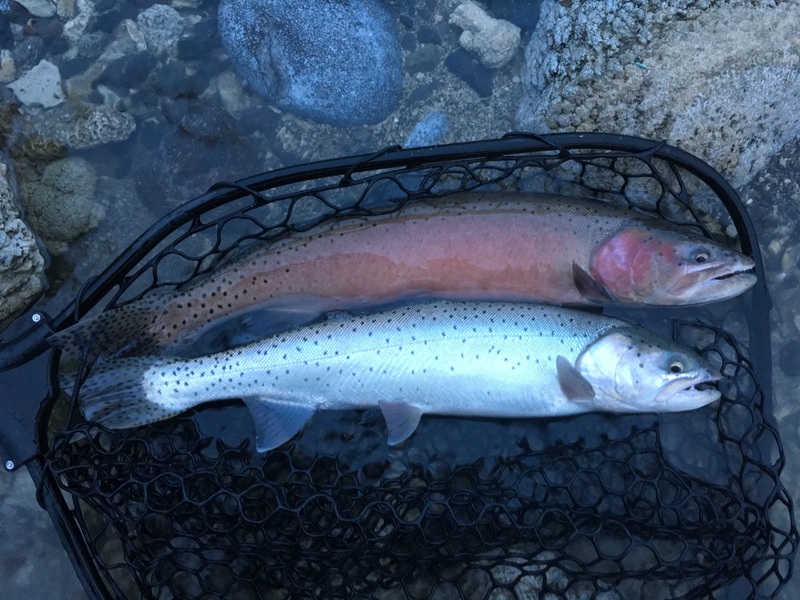 Note the Lahontan Cutthroat Trout buck on the top and the hen on the bottom.I first tried to catch Lahontans in Willow Valley Reservoir, a reservoir in Klamath County along the California border during the summer of 2016 (some six years after first catching Coastals). Unbeknownst to me, it had dried up the year before, and I was left catching Yellow Perch in the middle of the desert. My second try came later that summer. On my way to fish the Malheur National Wildlife Refuge’s short carp season, I decided to take the back roads to Burns. That took me through Denio, Nevada then north to the Alvord Desert. Once you hit the Alvord Hot Springs, the pavement ends, and you’re left on a northbound gravel road. It’s easy to drive too fast on a road that wends its way between two massive mountain ranges. My destination was Mann Lake. While Apple Maps had Mann Lake and nearby Juniper Lake swapped, I eventually course-corrected. I parked on the north shore and proceeded to fish my way around it. Seriously. Wading in the wet mud and shallow water, my legs were assaulted by some unseen menace. I’m still not sure if it was bugs or the alkalinity or what, but my legs were raw after I’d finished my loop. 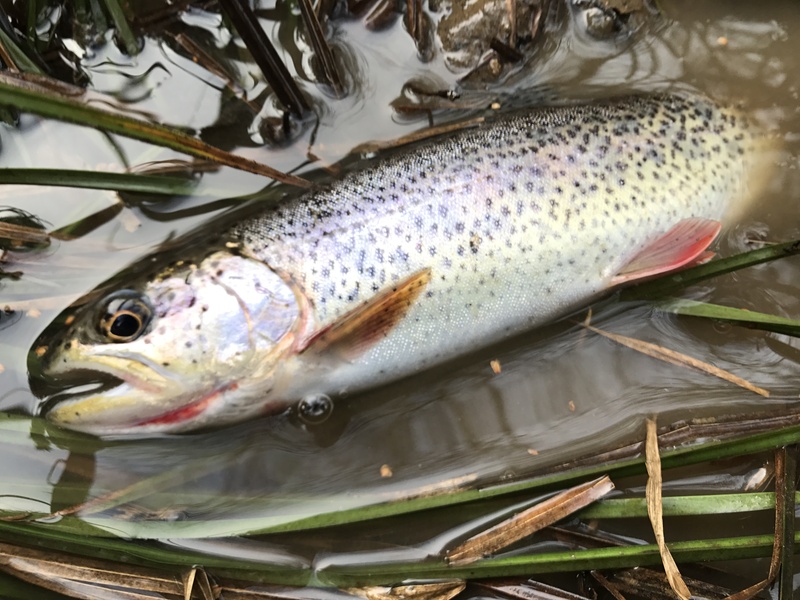 It was weedy and shallow, and though I had a single trout chase a spoon up to the end of my rod and actually come out of the water after it, splashing just a yard from me, I got skunked. You can read about that trip at Mann Lake here: Taking the road less traveled from Herald and News. 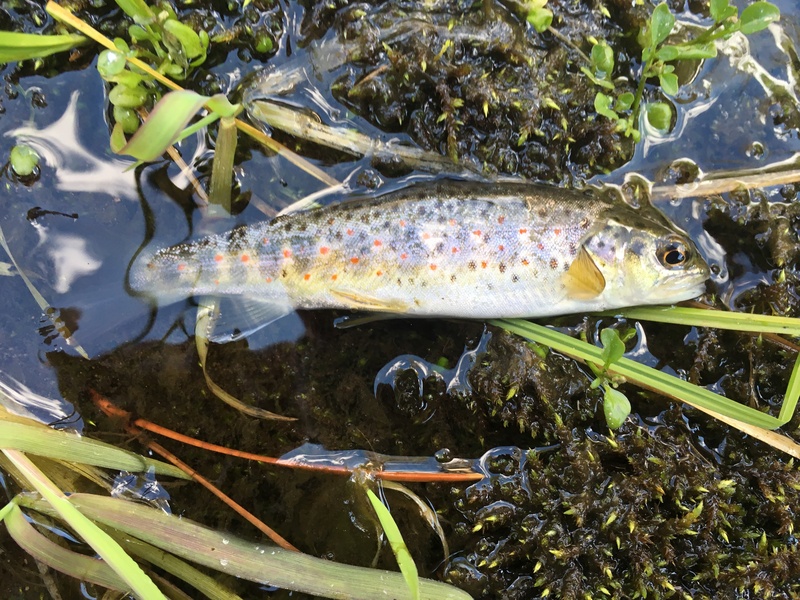 Lahontan Cutthroats are truly beautiful. The third time proved to be the charm. My friend, Ben Fry, and I were invited to join a group of Insta-famous anglers, including Bryan Glass (@wildtrout) and Brier Kelly (@brier_kelly). This strain of Lahontan Cutthroat Trout almost went extinct before rebounding to become a success story, and you can read my article Second Chance at Survival from Herald and News here. I won’t go into too much detail about this trip on my blog, because I already wrote about it. Check out Fishing Pyramid Lake — in pursuit of Lahontan Cutthroat Trout from the Bozeman Daily Chronicle and Getting Reel with Bryan Glass from the Herald and News. Bear River Cutthroat Trout The pink-on-brown coloration of these fish is really unique. 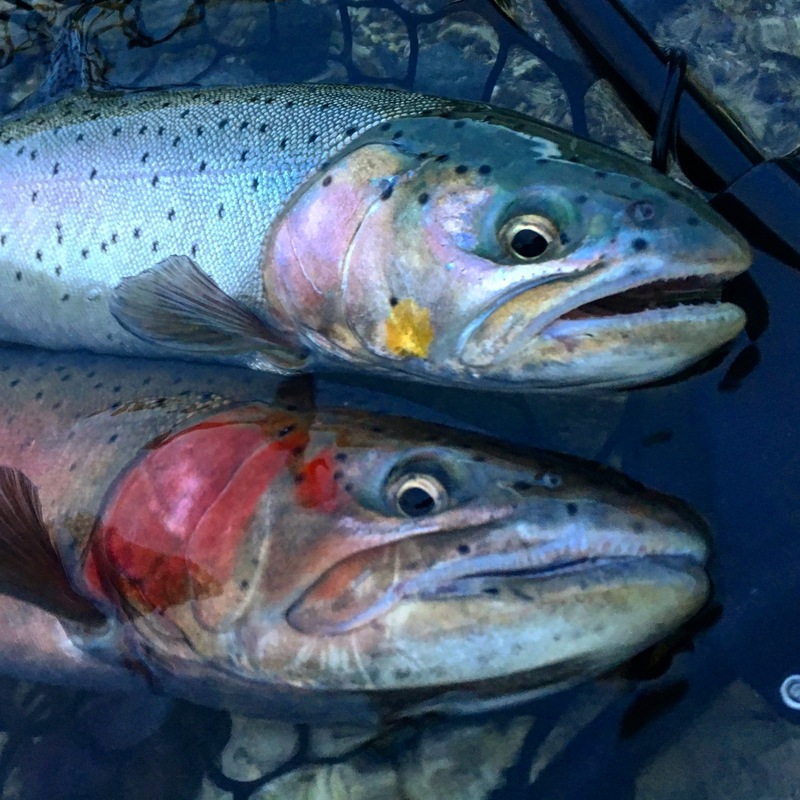 Coloration is one of the reasons Bear River Cutthroats are worth the trip to Utah or Wyoming. My third subspecies of this fish was a surprise. 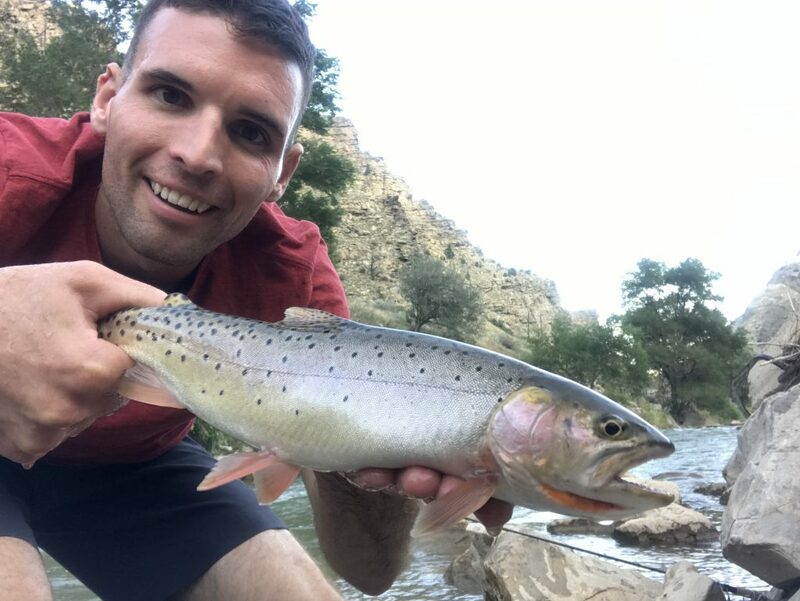 I was hoping for a number of other Cutthroat subspecies as I traveled across Utah, Wyoming, and Nebraska on my way to Officer Training School in Alabama during the summer of 2017, but the Bear River Cutthroat was the last fish I expected to catch. 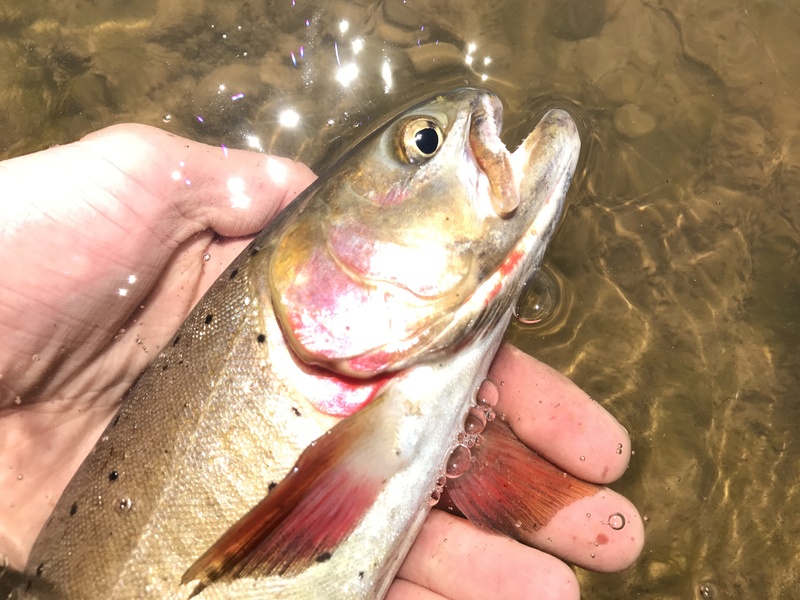 I actually wrote a pretty in-depth article about Bear River Cutthroat Trout for the Herald and News last year, so if you’re in the mood for an interesting, science-heavy read, check out Testing the waters of Wyoming — Bear River Cutthroat. This was the first subspecies described by Westerners and the fish Lewis and Clark first wrote about in their journals, earning Clark its scientific name. 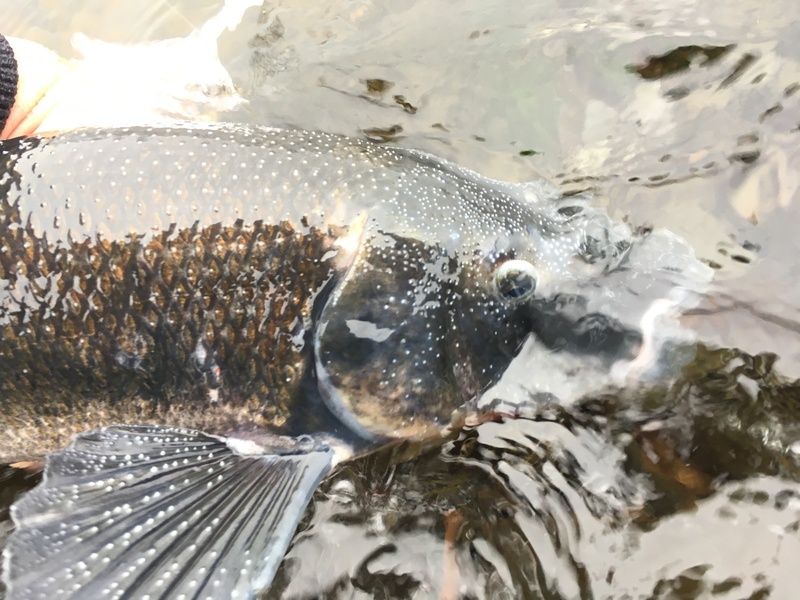 If you’ve never dreamed of fishing for Yellowstone Cutthroat Trout like Lewis & Clark, the latter being the person for whom Oncorhynchus clarkii is named, then you’re a dirty liar. He wasn’t wrong. These fish are damn fine. It was stupid-easy to get these guys to bite. 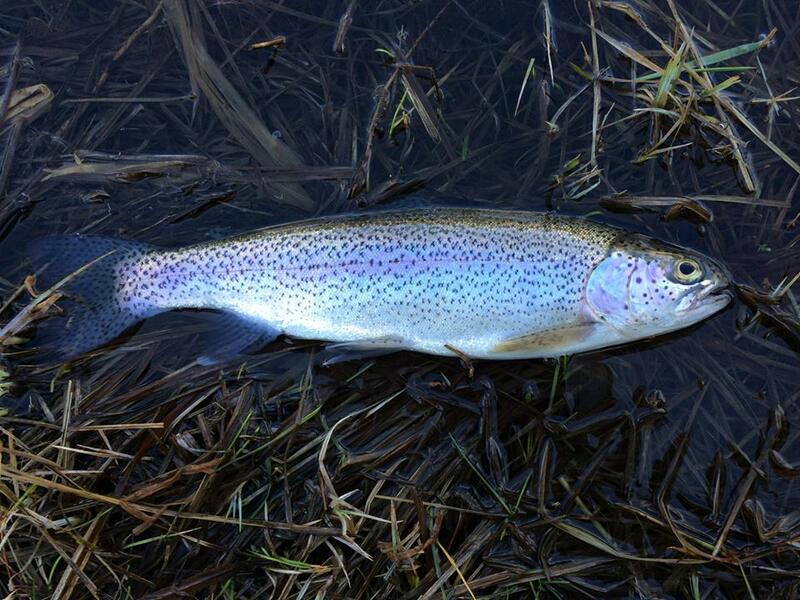 Tragically, Americans value planted Rainbow Trout more than Cutthroats. This has led to a displacement of cutties across much of their native range. As several subspecies go extinct (Alvord) or fight against that eventuality (Greenback, Paiute). Interestingly enough, though, a handful of Cutthroat subspecies have actually expanded their native range. Yellowstone Cutthroat have been introduced to a number of places outside their native range not far from where the intrepid explorers first described them, including parts of Utah. 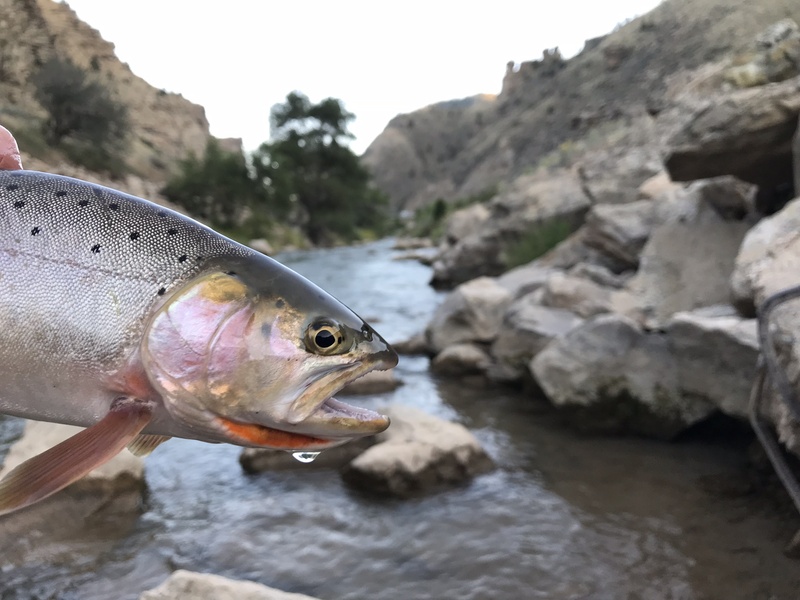 As I drove through Utah’s Price River Canyon, I couldn’t help but stop and fish. It looked so similar to Central Oregon that I had to wet a line. I tied on a Rapala and immediately hooked into some fish. A little research, and I realized they’d all been Yellowstone Cutthroat. What a handsome fish. What a handsome guy. Bonneville and Yellowstone Cutthroats look a lot alike, but the Bonneville subspecies like this one tends to have more dense spotting near the tail. Some fish you don’t set out to catch. 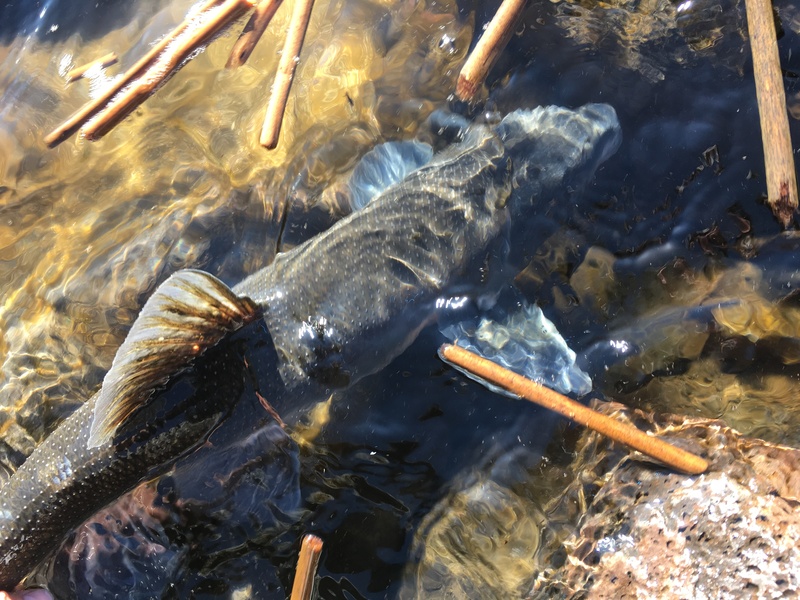 I was actually targeting two species of suckers in Utah, floating half of a worm just above the riverbed when this gorgeous little missile bit. It was my one and only Bonneville Cutthroat, and apart from a massive Brown Trout I lost shortly thereafter, it was my only fish that morning. Like I said, I love these fish, and as I catch more subspecies, I’ll add to this post. Read the next entry in #SpeciesQuest here: Species #35 — Buffalo Sculpin. Why this Eurasian import, the Brown Trout, is nicknamed the “German Brown,” is not verified, but I believe it’s because (1) it’s native there, and (2) the Red, Yellow, and Black spots are the same as the colors of the German flag. Boats have nightmares about this place. Hundreds of sun-bleached lodgepole pines crisscross the small stream, connecting two grassy meadows split by the crystal-clear water that gives life to an otherwise desolate place. Native Bull and Redband Trout have long since been out-competed by the invasive Brook and Brown Trout that call the waters of the Little Deschutes and its numerous tributaries home. It was opening day of bow season, and my dad and I decided to flee to the microclimate of the stream during that hot summer day, knowing full-well the deer would be bedded down anyway. Using small Panther Martin (Size 2) spinners, as we always did in those days, we caught a number of fish that looked immediately foreign to me. Dad identified them as Brown Trout, and I quickly became enamored with the idea of another new species. Before we decided to get back to hunting (I still prioritized hunting in those days), I tallied 10 Browns to 10 inches and an additional 30 smaller Brook Trout. I haven’t had many days with double-digit numbers of Browns since. Coincidentally, the Cleveland Browns haven’t had many double-digit days since, either. Read the next entry in #SpeciesQuest here: Species #8 — Black Crappie. Since catching his first Bull Trout in early 2004, the author has caught just a handful of these highly endangered fish. (Photo: USFWS Flickr). This isn’t my photo. 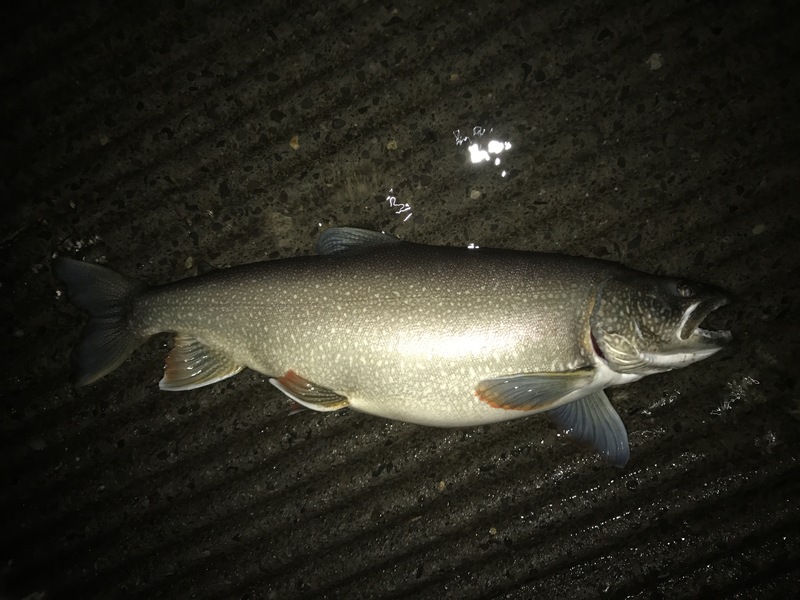 I desperately wish it were, but I haven’t captured a Bull Trout on hook and line since high school, and the few populations remaining in Southern Oregon are heavily scattered and/or inaccessible to anglers. 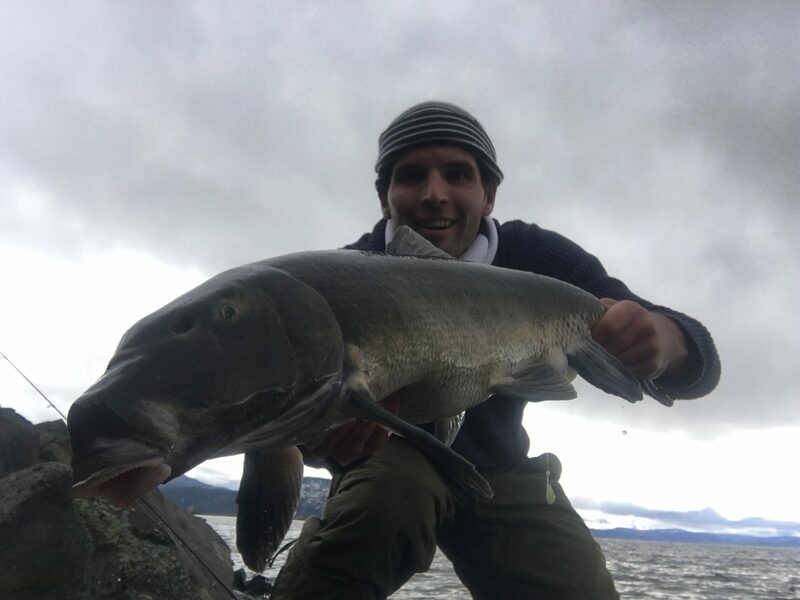 Update: As of late 2018, I found a sustainable Bull Trout fishery open to fishing, and I’ve since caught a lot of them, including the 30-plus-inch behemoth shown on my homepage. My grandpa, born in 1911, used to tell me stories of bounties paid for Bull Trout in his native Wyoming with the then-more-desirable Rainbow, Brown, and Brook Trout (none of which are native to Wyoming) quickly replacing native Bulls and Cutthroat Trout in much of their range before a policy reversal saved these species. 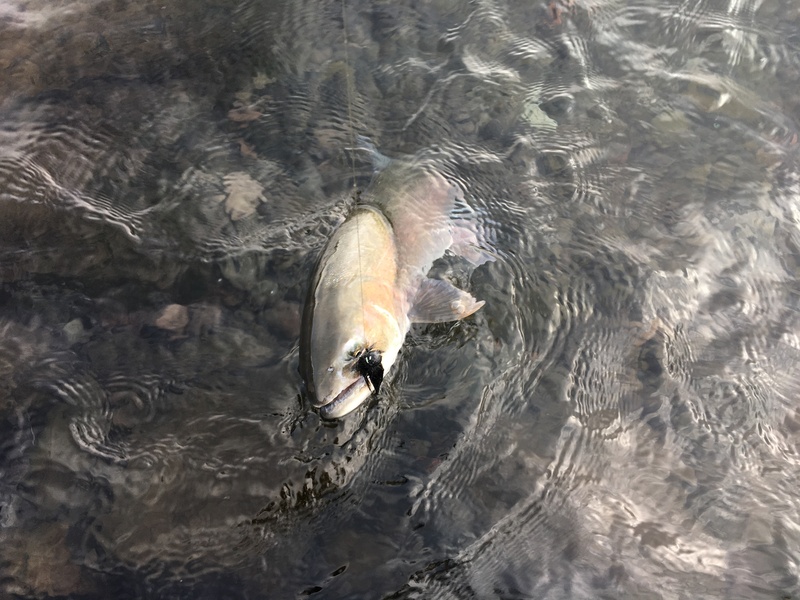 Oregon’s Bull Trout faced a similar fate, with the “harder-fighting” and “better eating” Brookies quickly rising up the Oregon angler’s target species list. That fish I caught in 2004 would prove to be just one of six Bulls recorded to-date, and I remember marveling at the size of its mouth compared to its relatively small body. Today, the only sustainable population of Bull Trout that allows harvest in the Lower 48 resides in Lake Billy Chinook, about three hours north of where I landed this Bull so many years ago. This spring, I plan to chase these Lake Billy Chinook Bulls for a chance to relive that feeling I first experienced 15 long years ago. Read the next entry in #SpeciesQuest here: Species #4 — Bluegill. Invasive Brook Trout were a staple in my childhood fishing pursuits. I caught dozens of these between my first fish and 2004; however since I didn’t keep records and don’t have pictures, I must defer to the journals I started in 2004 to determine species order. Brook Trout were widely introduced to Oregon nearly 100 years prior, and they slowly encroached upon the territory of native Bull Trout. Even 15 years ago, I remember catching stringers full of Brookies with my dad and younger brothers on tiny Panther Martin (Size 2) spinners. Limits on Rainbow Trout dropped from my early childhood 15 to 10, then to five, then ultimately down to two fish in streams before I got out of high school, but there remains no limit on Brook Trout in much of Oregon to encourage anglers to fight back against this invasive, East Coast char. The tiny streams we fished weren’t conducive for three young boys and a their father, given the lack of fishable water, limited visibility surrounding the water, and the competitive drive I shared with my brothers only when it came to fishing. 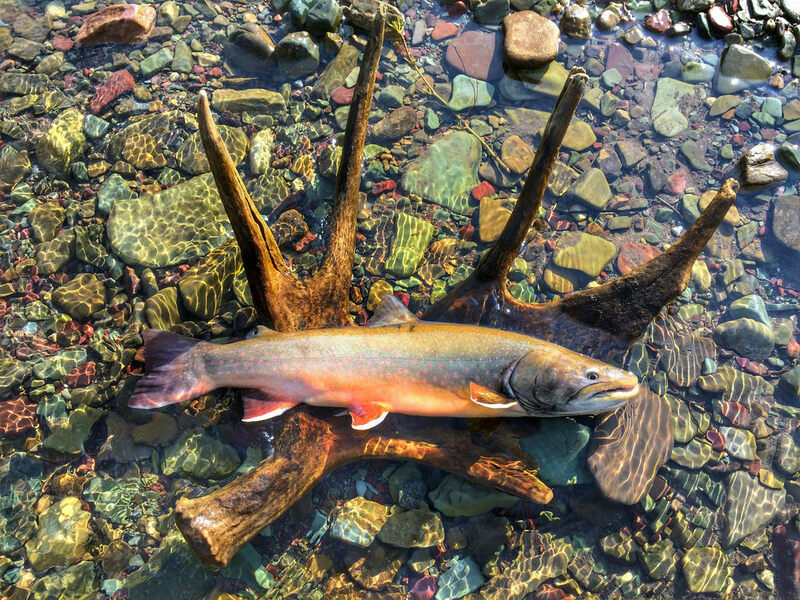 Read the next entry in #SpeciesQuest here: Species #3 — Bull Trout. 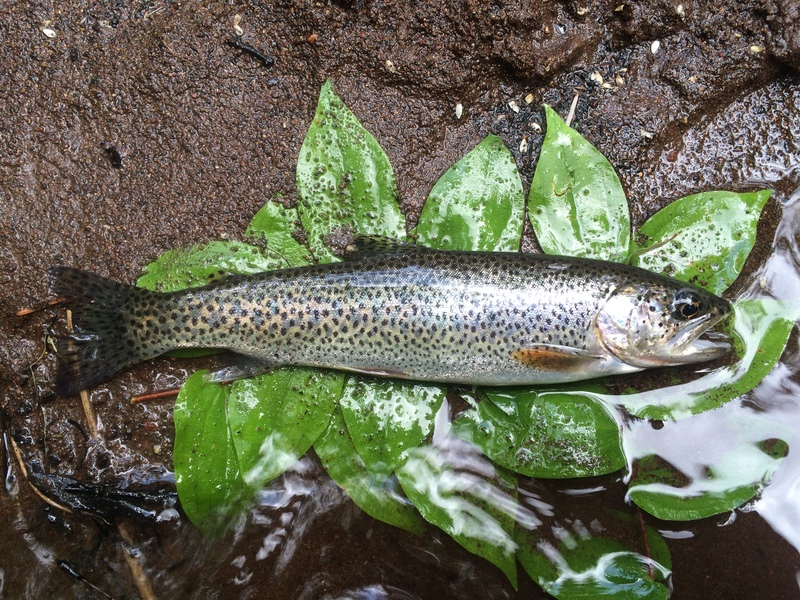 …or a wild Redband Trout. This is hazy. I’m not sure what day or even what year it was that I caught my first Rainbow Trout, but I have a picture, and I have a memory. My dad used to take me fishing with him, using an old canvas baby carrier with an aluminum frame attached to his back. He told me about all of the times I drooled or spit up on the back of his neck while he chased the wild Redband Trout (Oncorhynchus mykiss newberrii) native to Southern Oregon. He is some strange combination of trout purist and spinfisherman, never using a fly rod but only seriously targeting trout. He preferred wild fish in small streams to hatchery fish in lakes, but that didn’t stop him from chasing the latter. I distinctly remember reeling in a small wild ‘Band that he’d hooked while we took a break from the family camping trip/reunion we’d taken to Howard Prairie Reservoir in Jackson County, Oregon. I also distinctly remember fighting a big, hatchery ‘Bow on what I’m pretty sure was the same day. The former was nothing to write home about, but it was eight inches long, so it went on the stringer. The latter was about 16-18 inches in length. It hit Power Bait and started running. Not knowing what to do, I just started reeling as I walked slowly back up the hill upon which we were fishing. Dad grabbed the fish, and we put it on the stringer like we always did with trout in those days. Nearly 25 years have passed. I no longer keep wild trout, and I almost never fish for hatchery fish of any creed, but I still love stalking wild ‘Bands in tiny streams during the heat of summer, and I hope I can carry my son or daughter on my back someday to carry on the tradition. Regardless, Redband Trout became my soulmate that day. I just didn’t know it yet. 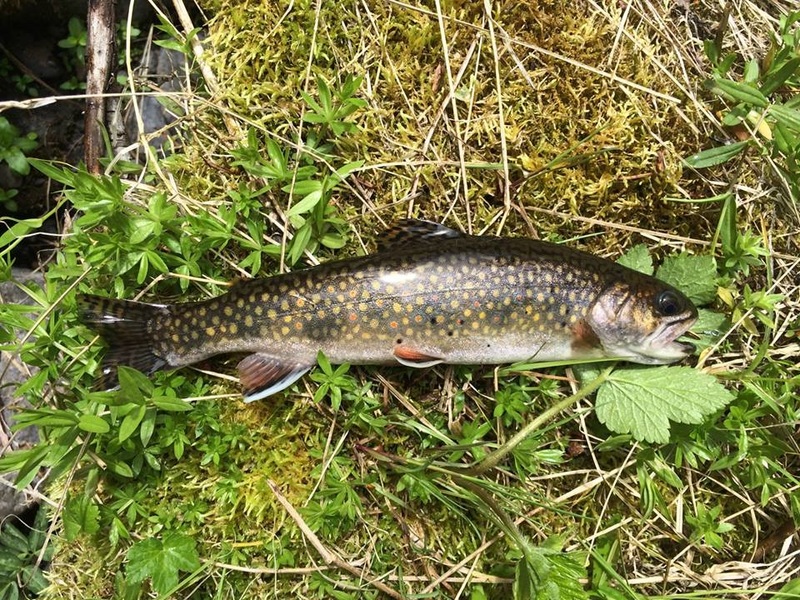 Read the next entry in #SpeciesQuest here: Species #2 — Brook Trout. At the Klamath River, it seems the wetter you’re willing to get, the more likely you are to get a nice fish, like this 20″ 3.625 pounder. The Klamath River is magical in October. The mornings are crisp and cold, and until the sun hits the water, your line will freeze if you take too long between casts. The afternoons are warm enough to shed the sweater and pants in favor of Hurley board shorts and a tank top. The water, aided by thermal inertia, is still unconvinced of the changing seasons, still clinging to the last vestiges of summer, even when the air turns cold, so you can wet wade in relative comfort. The evenings sneak up on you, and before you know it, you’re enveloped in darkness as the frost returns to the canyon. The Klamath — in early October — is, without a doubt, my favorite place to fish. I first fished the Klamath as a kid with my Dad and my brother Jake. We fished just below the J.C. Boyle Dam, and landed one nice fish apiece. Years later, on the day before high school graduation, several of my senior classmates and I headed to the stretch below Keno Dam for the first time. 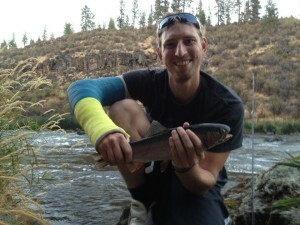 Five minutes in, and my friend Shawn Elliott hooked into the first of many huge Klamath River Redbands to follow. Since that day in 2008, I’ve learned so much more about the river: where to fish, when to fish, who to bring with me … and where, when, and who not to. In the fall of 2014, I went further upstream than ever before, finding great success through unconventional methods. For years I’d wet-waded, donning board shorts and Vibram Five Fingers shoes (okay, they look ridiculous, but no other shoe allows you the sensitivity necessary to safely wet wade the Klamath). I’d routinely get knee-deep in the water to access my favorite spots, but in 2014, I took it to another level by going chest-deep and half swimming, half bouncing off the bottom to get where I wanted to go. The flows had been low, and I used the giant boulders in that stretch of the river as current breaks, so I wouldn’t be swept away. With my rod between my teeth, I accessed parts of the river no flyfisherman in waders would dare go; places only those rafting down the river could access. In my first four trips (October 1, 4, 5, 11) that fall, I landed 50 fish, 10 of which topped three pounds. October can yield multiple 3+ pound fish in a day, like this 20 1/4″ 3.375 pounder caught the day of this story. 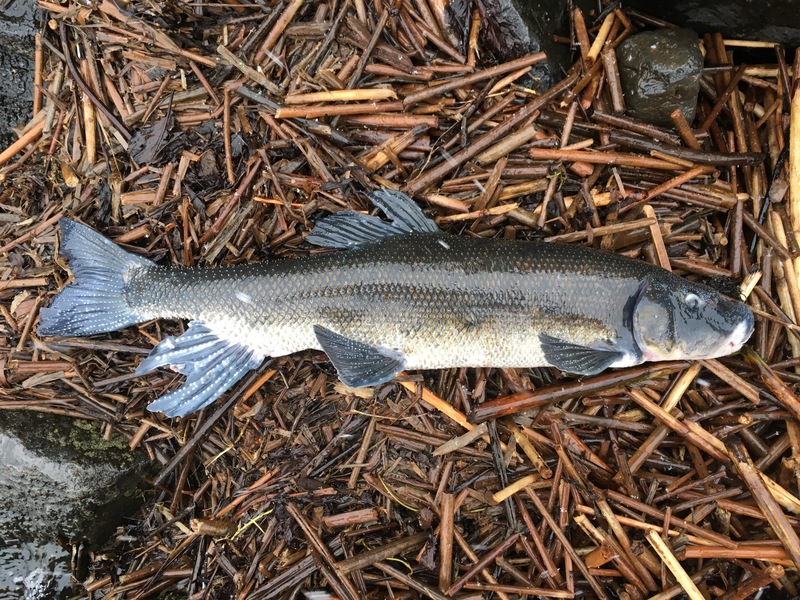 Klamath River Redbands feed heavily on minnows during the fall, including introduced Fathead Minnows, like the one in this fish’s mouth. So, on my next trip down, October 12, I expected the same results. I caught fish, but not as many or as big as I had the days before, so I decided to make an adjustment. Rather than slowly work my roundabout way across the river like I had the days before, I decided to try going straight across. I made the logical choice: cross at the narrowest part of the river where river otters always rafted down in groups. Sure, it was a fast run, but only about mid-thigh deep most of the way across, and a rock in the middle could be my checkpoint. From there, I could get to the large, weedy island that split the river in two. Two steps out, I slipped and almost ate it, because I was sore. 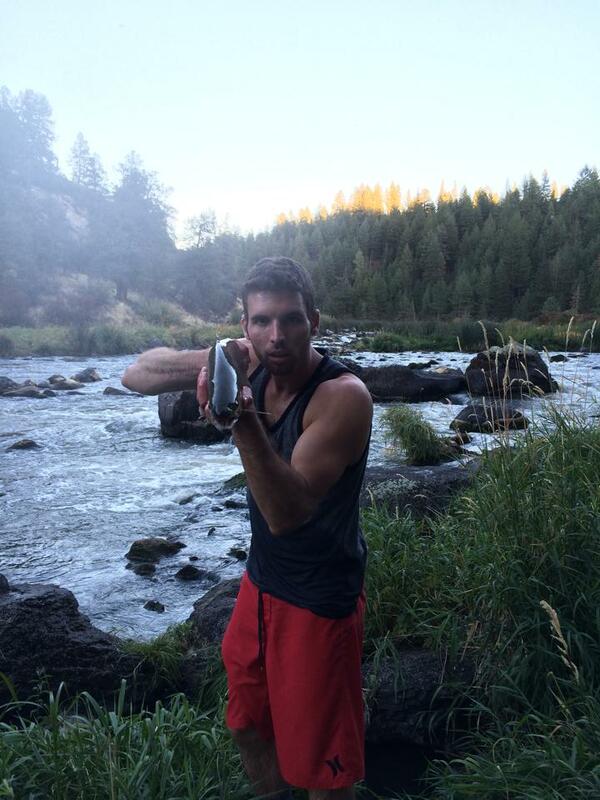 Side Note: Fishing the canyon how I do is a workout equivalent to running a few miles after leg day. I run several miles down into the canyon, walk along the rough and rocky shore, wet-wade by bracing myself against rocks in the current, then hop from rock to rock and occasionally do a little free climbing on the small cliffs in the area with the rod in my teeth. It’s a rush, but it takes a toll on your body. Machismo propelled me forward. I made it to the rock and took a break. I let my lure hang in the current and caught a little guy. Well, he was about 1.5 pounds and 15” long, but that’s a little guy for the Canyon in October. Strength returned to my legs, and I took a step. I felt the moss, but overrode my better judgement and committed my weight to it. As my foot slid out from under me, the current rushed along at almost 1150 CFS (about 150 cubic feet per second [CFS] faster than the day before), and pushed me over. I’d spent enough time fishing and rafting to know what to do. I put my feet out in front of me as the current had its way with my body. I kicked hard while keeping my knees bent, pushing myself back into the current to try and steal an opportunity to get back onto my feet. After a few tries and about 200 yards of drifting, I finally got to my feet. I promptly fell over again, but my struggling had gotten me close enough to shore to flail/doggy paddle the rest of the way. Exhausted, wet, bruised, and insulted, I used my hands to part the thick curtain of reeds along the shoreline of the island. Gasping and shivering, I was still hunched over, hands on my knees. I took a step and started to look up just as I noticed a yellowjacket land on my leg. My hand swatted it away, but I looked back down to see it had been replaced by half a dozen more. The next second passed by slowly as I realized the gravity of my situation. Then, they started stinging me. Desperation replaced exhaustion as I tried to sprint away while slapping them off my legs, my neck, my ears, my cheek, my arms, and my hair. More than a dozen stingers found purchase in my skin before I’d gotten out of the danger zone and killed them all. I’d stripped down to my underwear in the hundred-yard run over broken, rocky ground, stubbing my toes in the barely-padded shoes, but at least I’d had the presence of mind to hold onto my rod. My body screamed out in pain. Each step caused more pain, but more excruciating were the stings on my face, neck, and worst of all, just inside the hairline on my temple. I was in agony as I redressed, pounding each article of clothing with my fists and shaking it out before putting it back on. As I prepared to walk back towards the water, my feet got tangled up in fishing line. My fishing line. I’d grabbed my rod, but somehow managed to open the bail and hook the grassy ground right where the nest was. I pulled on my lure, but it wouldn’t come free. The last glimmer of hope went out. I begged, pleaded with those damn hooks, but they wouldn’t budge. So, I snuck up to the underground nest. Just kidding. I didn’t get stung again, but I was terrified I would. I got the lure, limped over to the far side of the island where I’d been trying to go all along and fished until the headache became unbearable, catching two more fish over two pounds. It took two pulls with pliers to get the hook out. It was initially buried to the shank, but the first pull got it this far. I also hooked one that would’ve topped five pounds, but it jumped, throwing the hook. Unfortunately, my line was tight, and it threw the hook right at my face. With my (dead) cat-like reflexes I was able to grab the projectile before it hit me in the eye, but it buried itself deep in my finger. It just wasn’t my day. This happens a lot when trying to unhook big, toothy trout, but usually they’re flesh wounds. This was deep. 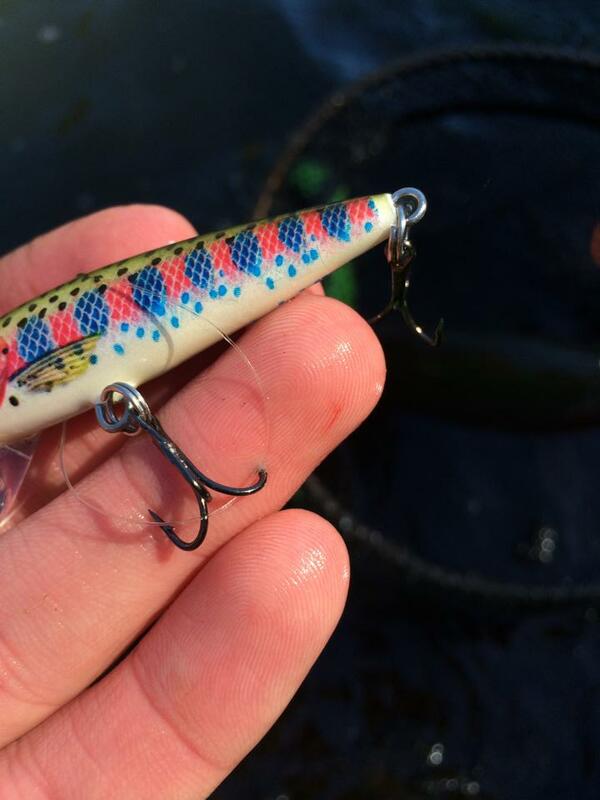 One of the three trebles was buried up to the shank (about 3/8″ on this specific lure) of my go-to Countdown Rapala . Using pliers, I took a deep breath and only cried a little as I pulled the hook halfway out. I paused to brace myself for the hard part: getting the barb out, but decided to stop and take a picture at that moment, because, why not, right? One more pull, and it was out. And bleeding. A lot. Realizing the next injury would probably result in the loss of a valuable appendage, I decided to call it a day. Crossing back over the river was not fun. Each time one of the stings got wet, it was like being stung again. To make matters worse, in the hour or so I’d fished, the water seemed to be flowing even faster. This time, I made no efforts to be cool or macho. I just put my rod in my teeth and swam across. I sat down on the grass and tried to bleed myself to sleep, but I was getting too cold, so I began the four-mile uphill track back to my car. I’d stepped on a hive at the river several years earlier (and once while grouse hunting as a kid, but that’s another story). The lone sting from that first faux pas at the river was on my wrist, and that yellow jacket must have been in an animal carcass, because the sting became terribly infected and ended up leaving a scar I still have. Mercifully, none of the stings from my terrible near-drowning, yellowjacket mauling became infected, but the headache was so intense for a week that I could hardly sleep, and typing with my impaled finger wasn’t exactly fun. But once the headache went away, and my energy returned, I was right back out on the river. Albeit one scar — the one under my left eye socket — heavier. Because, it was the Klamath River. In October. If I hooked you here, keep reading. Check out my Species Quest! Tennyson remains one of the most popular British poets, largely for the relatable nature of his works. 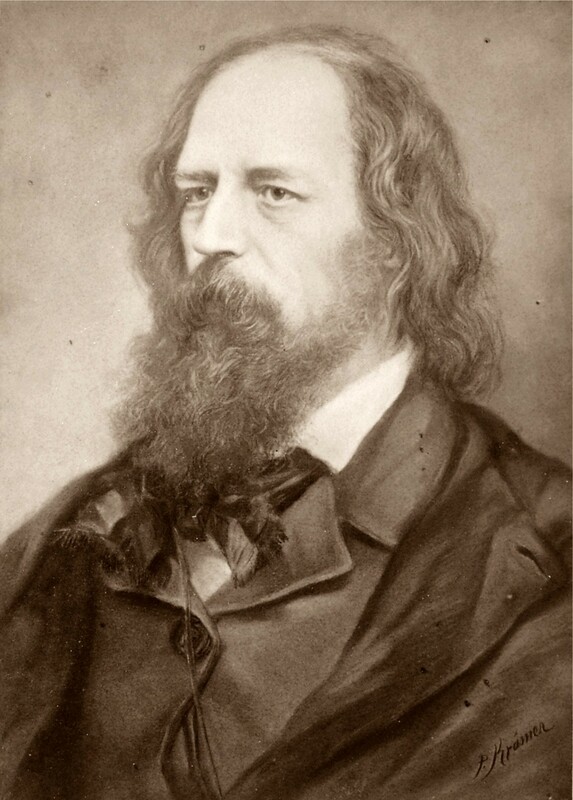 Well, Tennyson was obviously a fisherman, because anyone who has fished enough understands just how painful fishing can be. It doesn’t stop at painful. In fact, at times, it can be downright cruel. I’d long known fishing had a dark side, but it wasn’t until my second trip of the fall season to the Klamath River that I first experienced the painful, gut-wrenching misery that my lifelong passion could wreak. After powering through classes and an ASOIT (Associated Students of Oregon Institute of Technology) meeting, one of my best friends, David Clarke, and I performed our weekly ritual. We quickly changed into old clothes, grabbed a few McChicken sandwiches and iced teas, then headed to the water. 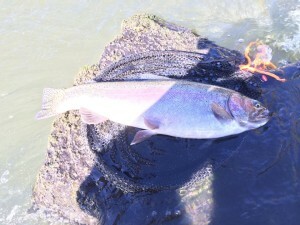 We caught a few of the healthy Redband Trout that make the Klamath Basin famous almost right away. 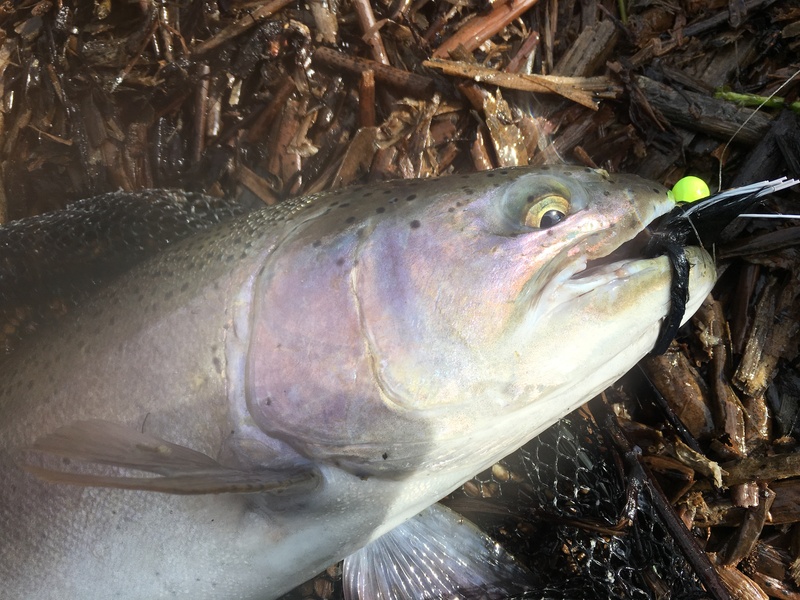 The fish of the Klamath are all deep-bodied, healthy fish which range in coloration from chrome-bright to more colorful fish, reminiscent of the Shasta Strain Rainbow Trout that many hatcheries raise for state stocking programs. While the average size has since declined in the Klamath, during that year and the five years prior, fish averaged about 15 inches long and about 1.5 pounds. David Clarke posing with one of the many fish we caught that day. That day, we were all about numbers, wanting to catch as many fish in the one-to-three-pound range as we could — not really hunting for trophies. Our lures of choice were Size 3 Blue Fox Vibrax Spinners . 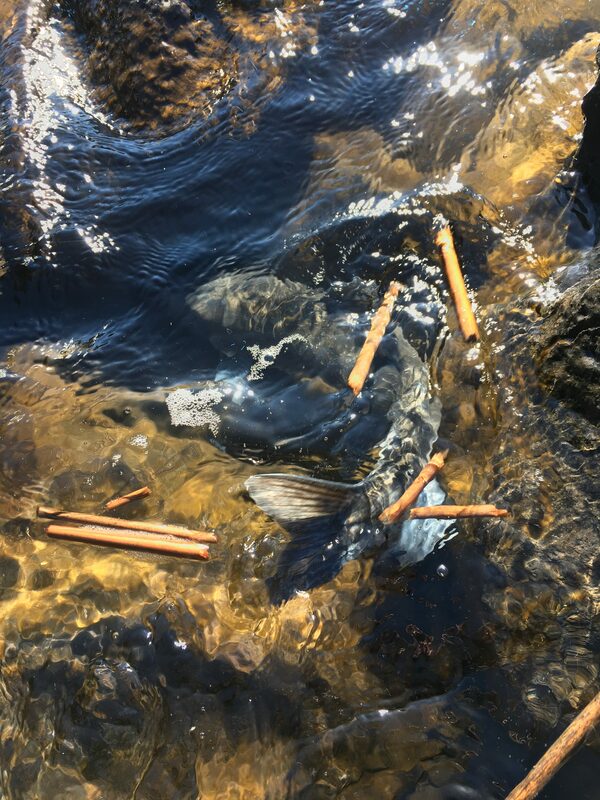 So, when my lure stopped in the current, I assumed it’d snagged one of the countless rock altars submerged in the river, on which I’d sacrificed hundreds of dollars’ worth of gear over the years. I assumed rock, until it moved. The fish was big. Really big. The river was only at about 800 cubic feet per second (CFS), which falls within the ideal range of approximately 400-1200 CFS, but this meant that the current wasn’t doing much of the pulling; it was mostly the fish. We were wet-wading, as I usually do when fishing there, meaning we were fishing from a rock in the middle of the river, surrounded by water on all sides, and about 50 feet from the nearer shore. The fish ran, jumped, and dove until I was finally able to bring it to net. Since David was on a rock a little distance away, I tried to net it myself. The fight had lasted several minutes, and it was tired enough to handle, but not too tired to be released. I fought it to the sheltered water behind the large rock I was standing on, taking the current out of the equation. I led it headfirst into the net. The only problem was that it didn’t fit. It ran away into the current again. I was dumbfounded. I’d never had this problem before. I tried again, easing it into the net, but it got free again. Horrified that it would throw the hook, I improvised the third time. Propping the rod beneath my arm, I again led it into the net headfirst, but this time, I grabbed it around the tail, sort of bending it into the net. Both its head and tail stuck out of the net several inches, but I’d done it. It was landed. For some reason, at this point my brain shut off. Of the hundreds of fish I net from this river every year, I normally keep about five for the table. This one was by far the largest I’d ever caught, and that’s why it’s now hanging on my wall — or, at least, why it should be. It does reside in my bedroom. Unfortunately, though, it’s haunting my dreams, not adorning my mantel, because what I did next, I still lose sleep over. Rather than try to get to shore to weigh, measure, and photograph it, I tried to do that stuff right there. In the middle of the river. On a rock with a surface area the size of a doormat. Somehow, it let me measure it with the retractable cloth tape measures I use that serve a purpose without hurting fish: 29 inches. My longest Redband up to that point had been 22 3/4 inches, and I’d landed that fish almost eight years earlier. Shocked and stupefied, thinking it was going to cooperate, I decided to weigh it. As I went to slide the scale under the gill plate, dream turned to nightmare. The fish decided to break free. The sheer power of this fish, this small salmon, in effect, was immense. It’s body wriggled and pulsated as if all its demons were being exorcised in my hands. The first thing I noticed were two of the three trebles finding purchase in the soft flesh of my thumb. The third treble held tight in the fish, though, meaning every time it wiggled, the hooks drove deeper and deeper into my thumb. Then the fish came out of the net, and the two hooks in my thumb held up the fish (which was, very conservatively, at least 8 pounds) for several excruciating seconds, before it threw the third hook and returned to the river, immediately darting to freedom, as I sat there, broken. Note the size difference between the small net (left) and large net (right). I upgraded to the larger one not long after this trip. Both Klamath River ‘bands pictured here are about 20-21 inches long and 3.5-3.75 pounds, but were landed with different nets. Dejected, we fished a little longer, but no amount of fish 16-18 inches could ease the pain. Poor David had to hear me whine and wallow for the next hour, as we approached one of my favorite spots: The River Monster Hole. I call it this, because you half-expect Jeremy Wade to pull an enormous, toothy beast from its depths when you first see it. You stand on a shelf at the base of a 50-foot cliff that sits just above the punishing current below, a current that has dug the hole almost 20 feet deep in the channel. Hoping the River Monster Hole would bring a chance at redemption, I changed from a spinner to my go-to CD-9 Rapala in hopes of enticing a larger fish with the larger lure. I dropped the rod to the ground, propping it between my knees as I held the line near the lure and clipped the line further towards the rod tip. My mistake hit me with the same slow, Earth-shattering realization I’d had just an hour before while trying to weigh my largest freshwater fish ever. Since I was holding the segment of line I’d just clipped, I watched in helpless slow motion, groping just out of reach, as my rod leaned away from me and plopped into the rushing river below. I’m sure my slow blinks had cartoony sound effects, as I stood there, speechless. I was devastated. It wasn’t the same caliber rod and reel I use today, but it was still a quality setup. It was the two pieces of equipment I’d recommend to anyone starting to get into fishing who wants a good setup but doesn’t want to break the bank: an Ugly Stik Elite 7-foot Medium-Fast Rod and a Pfleuger President Spinning Reel . Together, they’ll run you about $100 and work great for the average weekender for years. But for me, they were an extension of who I was. David did his best to console me, but he’d fallen in earlier and was soaked head-to-toe. Well, not quite. He was in a cast and had managed to keep his arm above water and dry, despite being soaked everywhere else. The October air had begun to turn crisp, and we looked at each other with one unspoken thought in common: leave. The walk up to the car and the drive home were both largely silent affairs as we commiserated together. It took me four days of bitterness and depression to finally climb back onto the horse. 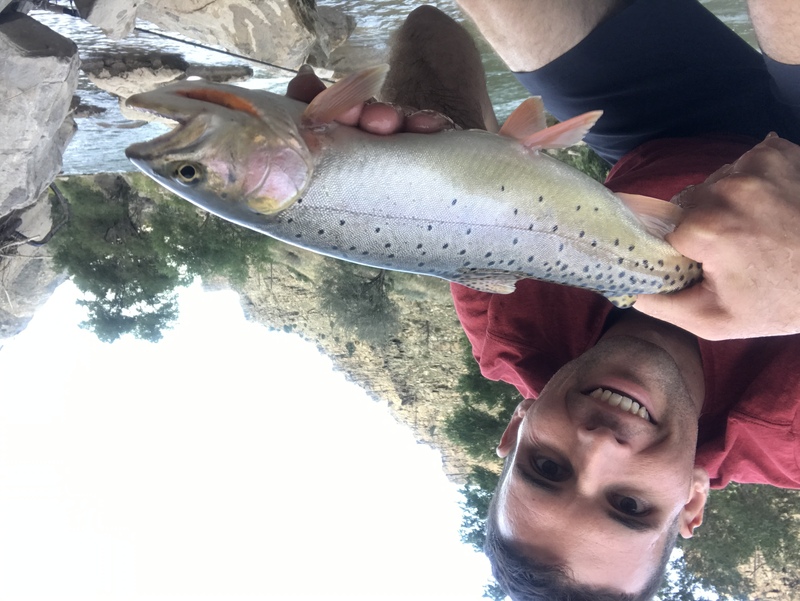 I purchased a new rod, tied on a lure (very carefully this time), and returned to the same river that had rewarded and punished me so extremely earlier that week. It took me almost five years, but I did catch a trout bigger than that. Then another. Then several more. I’ve now landed a lot of massive trout, but even bigger fish remain. 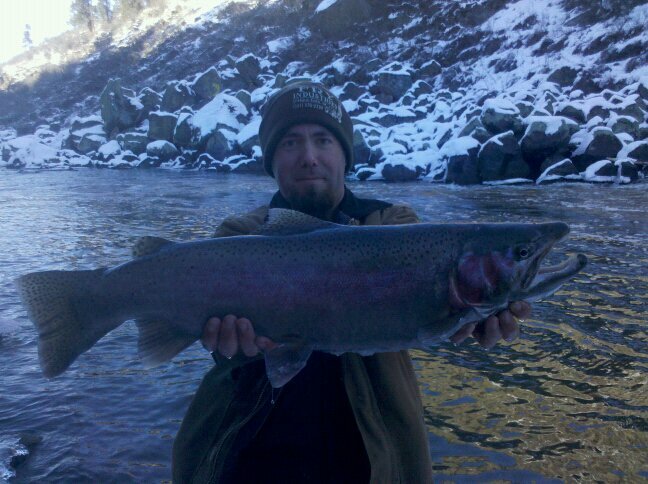 I know that fish and its peers still swim those waters, because in Winter of 2011, my friend Ben Fry landed this one. 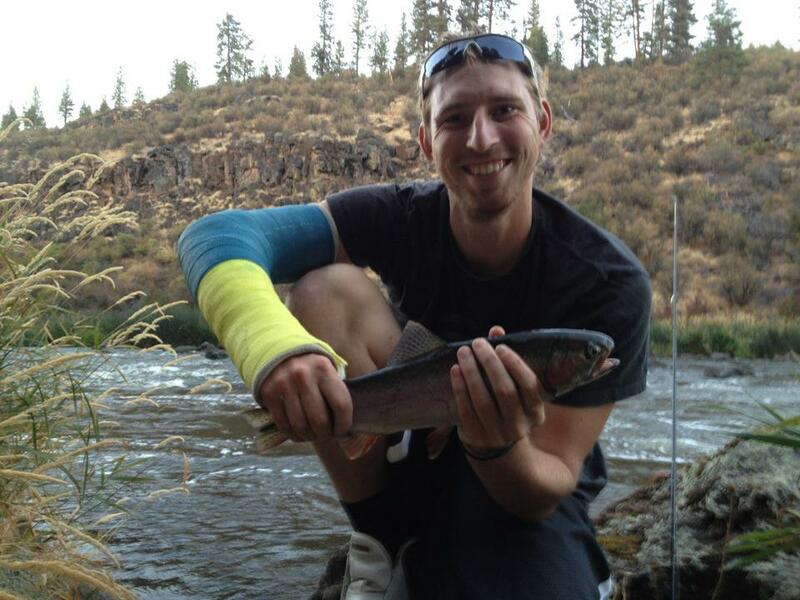 My friend, Ben Fry, landed this 32″ Klamath River Redband about the same time I caught mine. He didn’t have a scale, but this fish was well into double digits. He didn’t have a scale on him at the time, but it measured 32 inches long — even larger than the fish I’d landed. And, after a good photo, he released it back into the river, a gesture Tennyson would have applauded.